Gotron228's Revised Version on How to Fix Female Base Hitboxes. I posted this idea on the Nexon Forums a while ago but it didn't really get much attention as I'm not very "popular" on those forums like people with the names of Hazarath, ForteFZ and Enalis Nailo. Anyways I was looking on a website once which actually showed detail on how the Combat Arms Korea Beta was played out by Nexon Korea. 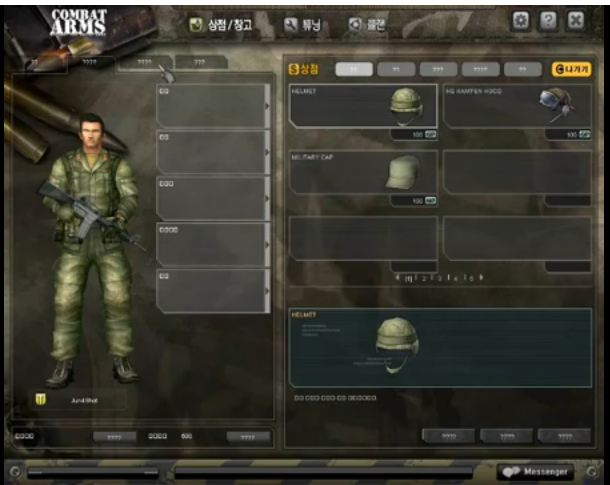 Most of the items and characters in the Korean Beta were actually quite different from the Combat Arms we know now. Also allot of the weapons we have now were actually used in the beta but were actually taken out of the game. The male bases were also actually quite small they were about the same size as a female base. IF you haven't gotten the feel of this post I am suggesting that Nexon shrinks the size of Male Bases to about the same size as a Female Base. This way Combat Arms will become more 'fair' in a way. I'm not saying that Female Bases are 'Op' but what I am saying is that it will help the game in the 'Gaming League' department so that more people with Female Bases are actually welcomed to participate in events etc. This is sort of a lame 'first idea' from me but I know allot of people get called a noob for having a Female Base character or mercenary in Combat Arms. Re: Gotron228's Revised Version on How to Fix Female Base Hitboxes. According to an experiment I saw on Youtube, the female hitboxes are much smaller than the male's hitbox, except for their legs. The hitbox for the females starts spreading out knee down. So making male hitboxes as small as females won't really balance things out but having the same hitbox for both males and females is a good idea. Maybe change it such that the standard hitbox size is the 'average' of the male and female hitbox? mrfarhan wrote: According to an experiment I saw on Youtube, the female hitboxes are much smaller than the male's hitbox, except for their legs. The hitbox for the females starts spreading out knee down. What I just bolded out there is what I was suggesting I probably should have made it more clearer but if you shrink the male hitbox to the same hitbox as a female it would make at least a fairer experience for the people who notice hitbox differences. Yeah it would make CA more fair. Female and Male hitbox doesn't really affect me when I'm not scoped in [except for Viper] but it's a real pain when sniping in small maps.. But anyway, to decrease the male hitbox to the female hitbox might make it harder to kill our opponents. Imagine a bunnyhopping male wearing a recon vest with a female hitbox size. Gah. Viper's hitbox is also too small. She already has +30 sprint +15 speed and no armour reduction..
males are pretty fat. Why not just make the males slightly smaller and the females slightly larger? THATSghetto wrote: males are pretty fat. Why not just make the males slightly smaller and the females slightly larger? Thats how females used to be until the community complained about having a fat female as their character. Or we can just keep the actual characters the same size, but increase the hitboxes. the problem with that slayer, is that people will still complain about hitbox issues because the females still look smaller, or that it's not "realistic". THATSghetto wrote: the problem with that slayer, is that people will still complain about hitbox issues because the females still look smaller, or that it's not "realistic". Slayer_of_1 wrote: Or we can just keep the actual characters the same size, but increase the hitboxes. Can be abused. If you play as a femme and you hide round a corner, you think you're fully concealed but your enemy can see your nametag. So what he does is shoot into thin air, where the hitbox is and get the kill. I find the male characters really squarish and fat. I meant that if the hitbox size was increased but the actual visual size of the females wasn't increased people would still complain. Yeah, because you will still tend to aim at the visible body. And since it's small, it'll still be unfair. Hm. But that's the only way to balance the hitbox out.. I thought it had been long established that you can not prove hitbox size with videos/in-game testing. This was posted on the Nexon forums a while ago and if I remember right even Haz said in response to this that it is "Impossible to determine hitbox size from videos". The best example of this is at 40 seconds into the video. Before we can decide how to fix hitboxes we really need Nexon to tell us if there even is a difference and how much of one there is. It can't be determined because of lag? I know lag issues can cause your hitbox to be slightly off.